I recently oversaw the development of two new features in the Afton Tickets system — one to fix a shortcoming in the original design of the product and the other to capitalize on an oppotunity to increase cash flow per-client. This page illustrates a couple highlights from my continued role as product manager (acting as BSA) for Afton Tickets, past the phase of initial product development. The nature of the work I did for rolling out these features was the same as described during initial development. The model for service fees that could be charged to customers per ticket purchased was very simple at first (basically it was in the format of $flat_base_amount + percentage_of_ticket_face_value%), since we had one client signed at the time we began ramping up full product development and we were contracted for this format of fee arrangement with that one client. I knew we could change the model later, if it was going to be needed to make any given deal. In practice though, even for clients where we were contracted for a simple fee structure, we found case after case where the fee calculations needed to be smarter. And once more clients started to sign on — especially multi-day festival events — we needed a very robust structure for managing service fees per-client/venue and per-event. 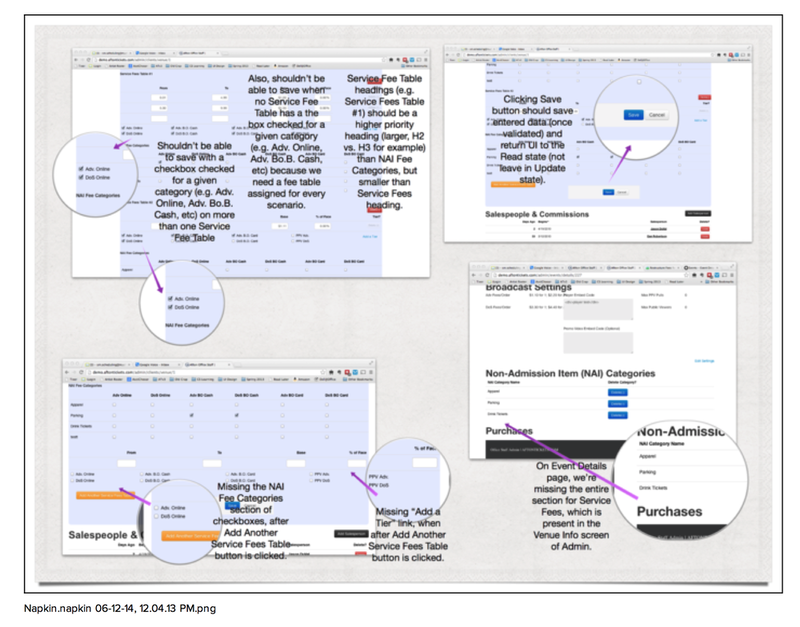 Here is a link to a PDF print of the full written spec for this change to the Afton Tickets system, along with the correlated Web UI mockup, subsequent conversatoin with lead programmer, and annotated screenshots document illustrating changes needed after my first review of the work submitted to me. We had identified many types of items that event organizers might want to sell along with their tickets, but the most compelling use cases were things that fit well with multi-day festival events: parking passes, camping passes, beer tokens, etc. The goal was to ensure that customers clearly understood when they were buying a ticket (which gets them into the event) and when they're buying something that's not a ticket. Similarly, once the purchase is made sucessfully, it needs to be clear to the customer (or whoever the customer passes the tickets/vouchers to) what is a ticket and what isn't, etc. Clarity was top priority. Also, we wanted to enable both the sale of non-admissoin items (NAIs) online, in advance — as well as from our POS, before and even during the event. This would allow us to offer a better, more secure method of taking cash and credit cards for selling beer "tokens" than the standard credit card maching festival events typically rent from a bank. With our system, no "beer token" (i.e. printed voucher for beer) can be issued without payment and none can be used more than once, because scanning the barcode once makes it invalid for future use. 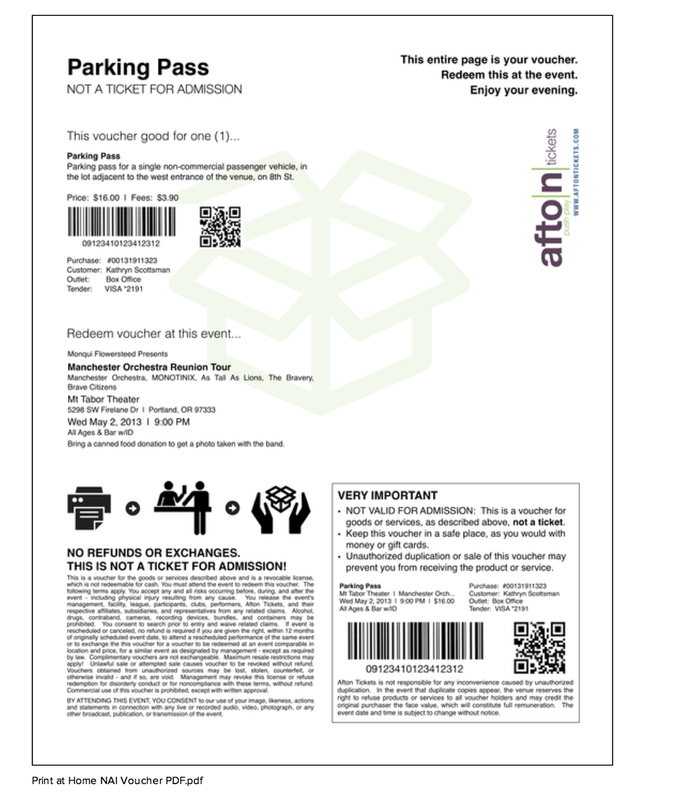 Here is the link to a PDF print of the full written spec for this augmentation to the Afton Tickets system, along with correlated mockups, design assets, designed document templates. Also included is a transcript of the discussion about finishing development, after the work was initially submitted to me.